Going back to my single-dad days, I'd drop my daughter off at her mom's, and then either hit Blockbuster or Best Buy and get a movie. Didn't really matter what kind, as long as it could sustain a couple dollars worth of entertainment; once I turned to the internet for advice and was recommended Secretary, an awesome selection which I never would have known to choose on my own. I, on the other hand, would pick things like Freejack, which I knew pretty much solely on the fact that its soundtrack had both Ministry and Jesus Jones. As far as sci-fi movies go, it's pretty standard 1992 — through the mid-90s, filmmakers were able to toss some pretty big-named actors into some pretty lame movies. Some was genuinely crap, like Lawnmower Man, Alien3, Robocop 2 and 3, and Johnny Mnemonic, but others are arguably pretty lame movies that were made better by the skills of the performers, like Total Recall, Demolition Man, Strange Days, and Terminator 2. 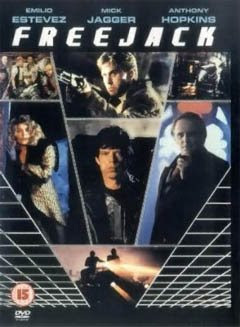 Just look at Freejack's case: on IMDB, the first four performers are Emilio Estevez, Mick Jagger, Rene Russo, and Anthony Hopkins; not a slouch among them, and there's at least another half-dozen recognizeable names and character actors rounding out the main cast. The story, however, is far from a four-star treatment. Emilio Estevez plays a young, attractive racecar driver in love, who flies out of control and crashes to his death. The crash, however, becomes an instantaneous example of a shell-game: in the far-flung year of 2009 — holy crap, that's now! — scientists teleported the just-about-to-be-dead Estevez and left an empty Formula 1 in his place. Something goes awry, largely from participating in time-folding in a bad part of town, and Estevez wakes up in the future and escapes. The premise of Estevez's rescue was that, since he was about to die anyway, nobody should let a good body go to waste. In 2009, science had perfected storing and transferring minds, and Estevez's body was intended to be occupied by a rich, nearly-dead man played by Anthony Hopkins. On the run in a not-so-distant future, Estevez is pursued by Hopkins' henchmen so they can recapture the 'freejack,' an occurrence that must be so common in the future that society already has a name for it. Everybody knows what a freejack is, and the reactions range from interest in claiming the bounty to cheering Estevez on for sticking it to the man. The film progresses as chase flick: one guy is on the run, other guys are after him. The 2009 date gives the movie a chance to be only kinda futuristic; there's just minor details that are a little off and futuristic, but otherwise the movie uses sets designed with police procedurals in mind, like gritty bars and dirty alleys. Along his escape, Estevez does what all good tossed-into-the-future characters do best: discover just how different the future is. His discoveries are rather mundane, and not unbelievable for the most part — he doesn't discover aliens living as humans, or robots running the government — which makes it more understandable when he takes it in stride. I hate movies where the main character walks around in gape-mouthed surprise at everything they see, but moves through the world like they've lived there all their lives. In the end, Estevez gets to keep his body because everyone believes that the rich Hopkins did succeed in taking over his body, he gets the girl, and everybody wins. 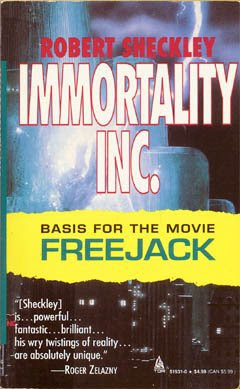 Immortality Inc. by Robert Scheckley is the purported source for Freejack, but the two share only the veneer of similarity. In fact, even if I read the back cover, I wouldn't have known this book was the basis for Freejack if it wasn't announced on the front cover. Immortality Inc. starts with a car crash as well, but in the year 1958, on a dark country road. Thomas Blaine doesn't escape death, though — his car hits another car, the steering wheel crushes his body, there's nothing left to save him…but he awakens in a hospital room. Body snatching and switching are a big part of the book, but in a far different way than Freejack. Blaine is brought to the future, not as a body, but as a disembodied spirit. He's an unwilling test subject: his newly dead ghost is brought through time to the year 2110 and inserted into a new body. Technology had been able to connect and disconnect bodies and spirits for decades, but to be able to bring a spirit from the past and connect it to a body in the future was a new development, and Blaine was the first successful attempt at it. What this develops into is classic 1950s and 1960s sci-fi: using unbelievable science and technology in a way that completely questions mankind's existence; most tend to make it so convoluted and unbelievable to be almost unapproachable. This book's conceit is that the afterlife is a scientifically-measurable fact, that the eternal soul is (with exceptions) eternal and independent of the body. The body, however, is simply a combination of crysalis and tricycle, the way a soul gets through life long enough to spring into the afterlife. Shortly after his resurrection, Blaine gets the chance to witness the process that brought him back, the body-takeover of a nearly-dead corporate executive trading up to a new body, one of the few somewhat-similar events as in Freejack. Also, as in Freejack, the process goes wrong, and the wrong spirit gets to keep the body. In this case, a nearby disembodied soul grabs the body before the executive does, and runs off into the night as a zombie. The book explains that all manner of superstition and legend, from ghosts to zombies to werewolves, are due to this scientific discovery that the human soul is real. What the book attempts to test and play with is the idea that, if the body is unnecessary in the long run, what fear of mortality is there? People commit suicide willy-nilly, others freak out and try to take as many people with as possible into the afterlife by going 'beserker' on a public street. Because not every soul is guaranteed afterlife, the Hereafter Corporation provides 'afterlife insurance', a process by which every person can make it into heaven without dissolving into oblivion, provided they can pay the price. When the Blaine project gets nixed because of the possible illegality of his time travel, Blaine is sent out into this world of 2110, and nearly ends up dead at every turn. This does, however, put Blaine in the position of fearing for his life, with everyone around him wondering why. The book doesn't give a nice tidy answer for either opinion on death, which may be more realistic overall, but makes for tough reading; it's hard to really understand why anybody does anything, whether the over-the-top suicides of the rich or the people fearing beserkers on the streets of New York, except possibly that people just do what people do. This ambiguity about the questions it asks is the book's weakest part, because Blaine is horribly unprepared for the world of 2110 but everybody else moves along without him affecting them at all. Nobody is surprised that he's from the past; nobody is concerned about his physical wellbeing or opinions, and few people are interested in helping him except for the two people most involved in his original death. His function as narrator barely requires his participation in the events of the book, except to format exposition as conversations. Lots of science fiction of that mid-20th century period, even the very good stuff, relies heavily on the deep explanation of Man's direction in the universe, which is helpful sometimes, but can be overpowering. It's also ripe for loose ends: there's no actual proof of an afterlife, just that ghosts can survive a while outside of their bodies, which still means the possibility of permanent mortality; much of Blaine's troubles could have been solved by swapping bodies (a common, if difficult and expensive, prospect) at more than one point in the novel; and despite omniscience being part of the benefit of post-death ghostdom, the police and others are largely unable to predict or observe forthcoming problems. It's science fiction, so the conceit should be taken with a grain of salt and run under its own rules, which isn't too hard to do with this book despite the big jumps of logic it attempts. As with Freejack, when you strip away the high-level assets, the story is a pretty plain mystery-adventure. Blaine manages to survive various learning experiences, and by the end everything is tidied up and tied in a little bundle: the mysterious stranger who had pursued Blaine throughout the book turns out to be the man in the other car that Blaine inadvertently killed; various enemies and pursuers are shaken or get their own desserts; Marie Thorne, the woman with a heart of ice that could only be melted by the love of a man from the 20th century, is revealed to be not just his savior, but the one who caused Blaine's adventure; and Blaine, recognizing a Man's value in the universe, gives up his own life as a honorable gesture to make the world right. In the end, not only does Blaine sacrifice his own life, Thorne sacrifices hers as a redemption for her sins, choosing to spend the rest of her afterlife with Blaine than to live with her guilt. A slightly more satirical writer, like Vonnegut, could have twisted these average aspects of 1950s literature within the contexts of the valuelessness of the human body, make it a wry commentary on man's existence rather than a plot-moving mechanism by which the main character gets from place to place in the book. Sheckley's ideas are interesting and ambitious, but the book doesn't quite reach the pinnacle it aspires to reach. As a tight adventure-mystery, Immortality Inc. is a capable, servicable novel, provided the reader doesn't look too deeply into the deep concepts skirted by the protagonists. While the film doesn't have any faithfulness to the original source material, there is an underlying similarity between the two works. Both aspires to be something more than it is at the core: a pulpy, generic story wrapped in some top-notch accessories. Freejack wasn't critically acclaimed, but as far as sci-fi chase movies go, it has its entertainment value. Immortality Inc. might not have been added to the library of Great Literary Classics, but it does manage to take an Asimovian level of deep-thinking and make it a simple linear pulp story. Stealing Books From The Library?!? ?